What defines the spaces that we love? What makes some places great? Why do we enjoy being in one particular place more than another? How can the natural world around us teach us to design in a way that will help create beautiful, functional, meaningful places? Within our built environment we eat, sleep, work and live in buildings that contribute towards our health in both positive and negative ways. Spaces can make us feel energised, make us feel stressed, make us feel confused, and sometimes bring us peace. The built environment should contribute towards our well-being and promote and engender health and happiness. The natural world can teach us how to design better buildings and public spaces. As our society becomes more urbanised, and people rely more and more on technology, our environment is becoming more fragmented, and our connections with nature and with community weaker. We all need to work towards creating better places to live and work, and to continue to develop an understanding of how this might be achieved. 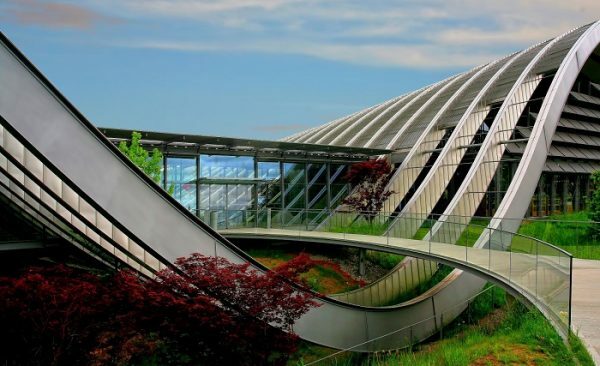 Biophilic Design applies the language of nature to the designing of the built environment. The Biophilia hypothesis proposes that humans possess an innate tendency to seek connections with nature and other forms of life. Biophilic Design looks at the human connection with nature and how patterns within nature can be used as tools for designing spaces that can contribute towards improving health and well-being in and around our urban spaces. It explores the innate relationship between people and nature, the love of life, and how experiences within nature can be integrated into the built form. The shapes and forms found in our natural environment can inform us. Botanical motifs, tree structures, shells and spirals, shapes resisting straight lines and right angles, can all inspire the design of spaces within a building. They can inspire and inform an entry lobby, a ceiling coffer, a staircase or study nook. For many years now, researchers and designers have been working towards defining aspects of nature that reflect our satisfaction with the built environment. Founded in 2006, Terrapin Bright Green is an alliance of environmental and design experts. They have created a framework for Biophilic Design. They have identified nature-health relationships most important in the built environment – those that are known to enhance our lives through a connection with nature. The 14 Patterns of Biophilic Design are divided into 3 groupings: Nature in the Space Patterns, Natural Analogues Patterns, and Nature of the Space Patterns. These patterns create a framework on which to apply to the designing of interior and exterior spaces that make up our environment. Partnering design influenced by natural phenomena is design based on the evolved built environment. A Pattern Language, co-written by Christopher Alexander, Sara Ishikawa, Murray Silverstein and others was first published in 1977. It is centred on the premise that the evolution of villages, towns and cities over the centuries, informs us of the core design elements we intrinsically and subconsciously desire in our built environment. It distils observed human relationship with the built environment into series of design guidelines to provide an environment that nurtures our physical and emotional wellbeing. The book provides a language that enables us to create our own environment. A language that is made up of tools or patterns. The patterns form part of an environmental language, to assist people to create architecture, building and planning that is deeply rooted in the nature of things, and can make life meaningful. The ideas are timeless, and many we easily recognise as being so logical and so obvious that it seems unnecessary to have to document them. The patterns are derived from careful observation and study of the built form and how it has evolved, particularly over the last five hundred years, within varied cultures around the world. A Pattern Language delivers us tools that are based on human, natural considerations; tools that can help us create places that can make people feel alive and human. A Pattern Language shows us how we can learn from the societies that came before us, from a time before technology, and a time before industrialisation. It also applies a language from which we can design, a language that seeks to create places that help enrich the way we live. Monotony, repetition and rigid frameworks dictated by formula alone, are the antithesis to Biophilic Design and the design tools explored in A Pattern Language. Contemporary design, concentrating on a pragmatic approach to a project brief, too often creates uninspiring, inhuman spaces. By observing patterns of the natural environment, and by learning from human based design developed in our communities over hundreds of years, we can work towards creating more desirable spaces for all of us to live, work and play in. A Pattern Language Centre for Environmental Structure Oxford University Press, New York 1977. A Pattern Language is the second in a series of books. Volume 1 – The Timeless Way of Building, Volume 2 – A Pattern Language, and Volume 3 – The Oregon Experiment.